Halloween is the best season for crafts! It’s also the best season for horror. AND the best season for books. 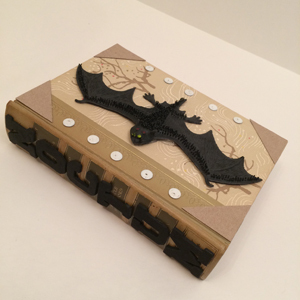 So what better than making your own spooky book craft? 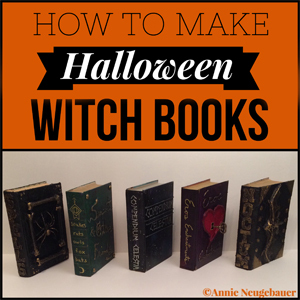 I found the perfect combination in these DIY Halloween ‘witch books’! They can be as intricate or simple as you’d like them to be, really. 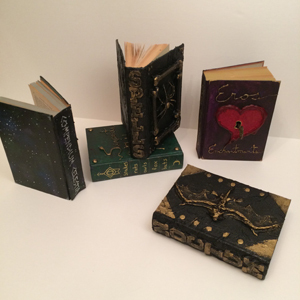 I even ended up painting some page edges and drilling into some of my books. They don’t have to be witch-themed, either; that’s just what I was feeling this year. You could make them demon books, monster books, whatever strikes your fancy. 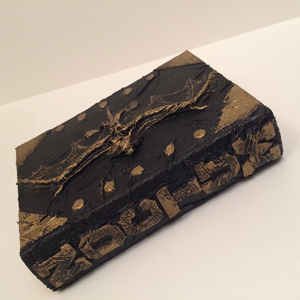 I took this online tutorial and ran with it to set up my own grimoire mantel décor. Today I’m going to share with you how to make your own. The most important part is the book, of course. Hardbacks work best, and because I can’t bear to destroy perfectly good books, I elected to use old, falling-apart abridged editions that no one would want to read anyway. (The book guilt of a writer!) 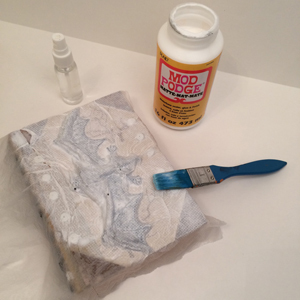 You’ll also need Mod Podge or a similar craft glue, hot glue, paper towels, paints of your color choices (I used black and gold for the example book), a brush, pencil/markers, and whatever 3D objects you choose to glue to the front of your book to create textural effects. I used foam letter stickers, bone shaped beads, a plastic spider, a rubber bat, and an old key. Thumb tacks and cardboard cutouts also work well, but in the absence of tchotchkes you can always draw your own designs with hot glue – though that is trickier. A small spray bottle of water and metallic paint pens are also handy if you have them. Don’t forget your witch’s familiar helper cat! Your first step will be deciding on your design and laying out your objects and lettering. If you plan to outline letters or shapes in hot glue, it’s a good idea to draw on the cover in pencil and/or marker first so you know it’ll fit and you’ll be happy with it. Thumb tacks are pretty, but dollops of hot glue create a similar effect in the end. Foam letters are the easiest way to include a title, but you can also write that in hot glue. I found with my books that even thicker items like this cheesy rubber bat looked cool in the end. Once everything is dry, it’s time to paint. Chances are you’ll start this step off excited and finish it disappointed. Don’t worry; cooler things are coming! Again, try to get full coverage with your base paint, getting down into all the nooks and crannies so your book looks like one piece. Again, let this dry fully before the next step. Now comes the really exciting part! Your metallic paint will make this baby come to life. (Not literally, unless you wove some really good magic into yours.) I found that gold contrasts nicely with black, but you could use silver on navy, bronze on green, whatever. You can use a brush for this, but the tip of my finger gave me the most control over where I put my highlights. That’s what this is: a highlight for your 3D objects. You can barely kiss them to make it subtle, really cover them to make them bold, or do like I did and go somewhere in between. Play around with how much of your lettering you want to show, too. Paint is always fixable, so don’t sweat this. Just remember to let each coat dry, and you can’t go wrong. TODAY’S GIVEAWAY: Scarlet Galleons Publications is giving away an ebook copy of Dark Hallows II: Tales from the Witching Hour (Volume 2). 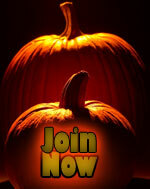 Comment below or email membership@horror.org with the subject title HH Contest Entry for a chance to win. BIO: Annie Neugebauer (@AnnieNeugebauer) is a novelist, short story author, and poet. She has work appearing and forthcoming in magazines such as Cemetery Dance, Apex, and Black Static, as well as anthologies such as Bram Stoker Award finalist The Beauty of Death and #1 Amazon bestseller Killing It Softly. 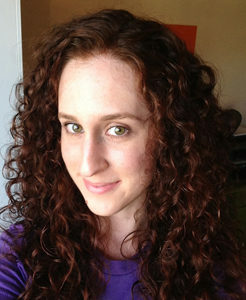 Annie’s a columnist for Writer Unboxed and LitReactor. She lives in Texas with two crazy cute cats and a husband who’s exceptionally well-prepared for the zombie apocalypse. You can visit her at www.AnnieNeugebauer.com for blogs, poems, organizational tools for writers, and more. 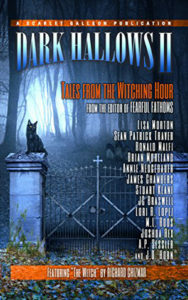 Dark Hallows II: Tales from the Witching Hour (Volume 2, published by Scarlet Galleon Publications, edited by Mark Parker. With Dark Hallows, readers were taken to the very heart of Halloween. With Dark Hallows II: Tales from the Witching Hour, they are taken one step further, to the early-morning realm of the ‘Witching Hour,’ where black magic is said to be at its most potent, and the threshold between the living and the dead grows frightfully tenuous. Lovers of Halloween and ‘dark’ fiction, will relish in this collection of 13 chilling tales, which include all-new works from: Richard Chizmar, Lisa Morton, Sean Patrick Traver, Annie Neugebauer, Ronald Malfi, Brian Moreland, James Chambers, Stuart Keane, Joshua Rex, JC Braswell, M.L. Roos, A.P Sessler, and J.D. Horn, bestselling author of the ‘Witching Savannah’ series. For three nights the dream had been nothing but memory replaying itself inside Hellen’s mind, restless and aware she slept but unable to wake. Helpless, she stood at the front of the crowd, refusing her father’s attempts to draw her under his arm, staring instead up at her mother’s stoic face with her own jaw clenched tight, shoulders stiff, arms wrapping her cloak about her. The morning smelled of wet wool and animal dung. The magistrate intoned in a low, hollow voice, “On this day of the twenty-third of October on the year of our Lord, 1596, under the power vested in me by Fyvie court and condoned by the Royal Scottish commission, I hereby condemn Marjorie Urquhart to death by burning.” He lowered his torch and lit the fagots piled around her mother’s feet. They caught in a hungry billow. The villagers had refused to mix in green wood like she asked. The younger wood smoked more, and might have sucked her mother away from misery sooner. This wood was all dry, carefully gathered. Hellen stared into her mother’s eyes – so piercing and green. When Hellen was a lass she’d asked her father to tell her the story of how those eyes had made him fall in love with her mother, over and over. Like a living emerald, he used to say, smiling at Marjorie over Hellen’s head. Like the grass in the highlands after the spring rain. They cast a cantrip over me, those eyes. They held me enchanted. Kind she was not. She stabbed me through the heart and I loved it. The wording no longer seemed romantic. Not after Giles had testified against his wife. Not after he had betrayed her, innocent, to prove his innocence. Hellen shrugged off his arm, looking into those beautiful eyes. “I love you,” Marjorie said, panic singing the edges of her tone, but still it carried the tenderness it always carried when she spoke to her only daughter. The crowd murmured, but Marjorie said again, louder, “I love you.” She could have been speaking to her husband or sons, but Hellen knew she spoke to her. I love you too, Hellen mouthed. Her heart had never beaten so hard. Her mother was over fifty, aye, but still in good health and too young to die. She’d yearned to see Hellen married with children of her own, and with Hellen over twenty and betrothed, surely she would not have had long to bide. The flames rose to catch the plain white robe they’d draped on her. That’s when her mother started to scream. 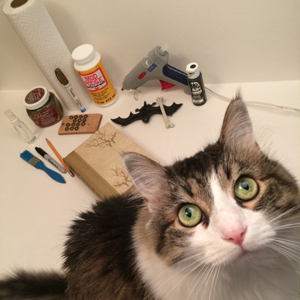 Thank you for your instructional step-by-step guide and accompanying photos Annie. 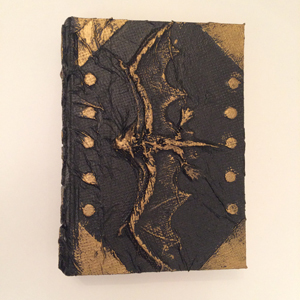 I liked how you aged the bat on the cover and the lettering – very beautiful! Ooh, or you could enhance the cover of a blank hardcover journal for writing! I love your kitty! I wanna give your ham ham all the scritches there is! This was a really nice step by step blog post! I think I could follow this and give it a try! Or make it a joint project with my GF. Okay, off to make my witch book! Great craft and great excerpt! Donald- I think that’s a fantastic idea! 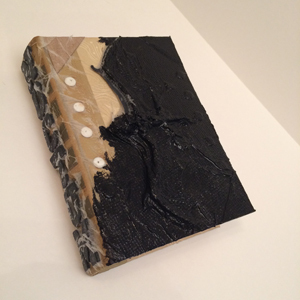 As long as you’re careful not to get paint on the pages the inside still functions normally. How cool to do your own title? Love it! Nicholas- She’s a cutie, isn’t she? And she just LOVES being right in the middle of everything, haha. Thanks! I hope you/you and your GF have fun with it! Holler if you run into any questions. Lisa- Thanks on both counts!